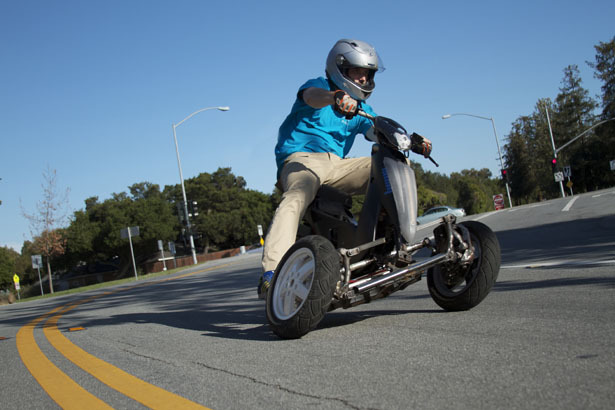 Whether you think electric motorcycles are the future for all of us or a purely urban vehicle for the city dweller, you can definitely expect to see more of them and, at this week's Consumer Electronics Show, Sway Motorsports is introducing the Sway, an all electric tilting three wheeler. The Sway is targeted at the in-city rider. With an overall width of only 35 inches you can still squeeze through traffic like a motorcycle and fit into motorcycle parking spots while having the stability of three wheels. It has disc brakes all around and regenerative braking to help with battery life. There's also a reverse so you can back up under power. Capable of carrying up to 350lbs, Sway can accommodate a passenger and up to 4 cubic feet of locking storage. An interesting design feature of the Sway is how your legs move in a turn, much like a skier, inside leg rising while your outside leg extends. You're taking an active part in the degree of lean instead of having your feet planted on the pegs or floorboard. It might seem a bit strange at first for current riders, but it could be fun, once you get used to it. The Sway will be available in three models, the Basic, the Lithium and the LithiumPlus. 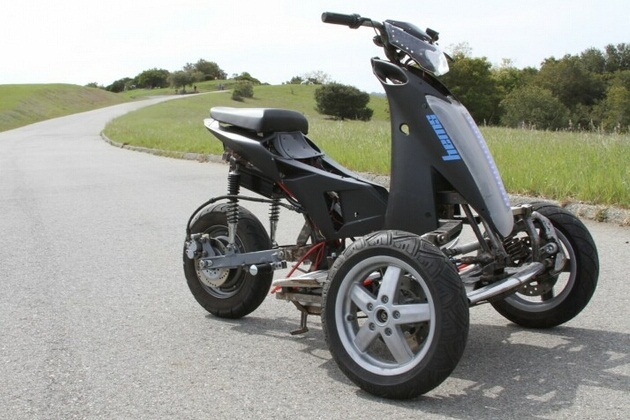 The Basic at $4999 is just that, with a 20 mile range, a 35 mph top speed, lead acid batteries and a weight of 280 pounds, it can almost be called usable. The Lithium at $7999 has a 40 mile range, top speed of 60 mph and weighs in at 220 pounds. In response to the demand, we are jumping into designing and building the LithiumPlus, and expect to have final images and a working proto of highway version by summer." The Sway looks like it could be a cool urban ride, leaning into turns makes any trike better, and in some settings the range and speed will be sufficient for the short runs and commuting a vehicle like this is designed for. Since the EV incentive expired at the beginning of this year, the price listed is what you will pay and Joe said the prices were set with the expiration in mind. Plans call for a California focused 2015 launch date. For buyers looking for another electric alternative, the Sway presents a viable option. Will it attract current riders? I'm not sure, but non riders are not likely to be intimidated by it and may find it very appealing. Interesting.